NOTE: Small parts, keep away from children. Application: compatible with all 1.75mm V6 E3D Makerbot 3D printer. 12V high speed fan with shroud. PTFE/teflon Tube: One meter long, 4mm OD 2mm ID. 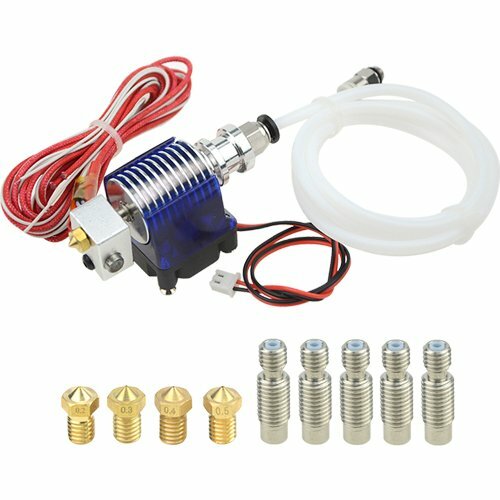 All metal v6 j-head hotend full kit, including 4 pcs extruder brass nozzle print head + 5 pcs stainless steel nozzle throat. Sturdy construction between the heater block and the heatsink, nozzle and tube connect seamless, prevent material leaking and blocking. Hot end can be used for ABS, PLA, PETG, and most any other conventional print materials, great replacement for your broken unit. Compatible with all 1.75mm E3D V6 Makerbot 3D printer, easy to install, NTC connector with terminal, install directly.